PGMA flanked by Cong. Bingbong Crisologo and QC Vice Mayor Herbert Bautista as Pres. 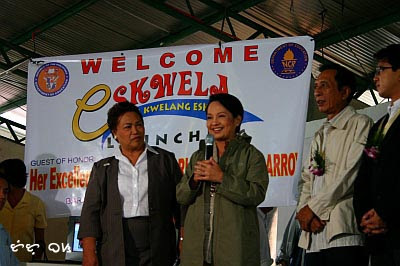 Arroyo announced the launch of eSKWELA, something like e-learning badly needed in these islands called the Philippines to bridge deficits in education. The president also announced the increase in P1B budget allocation for education, much needed to build more classrooms to service the bludgeoning population. 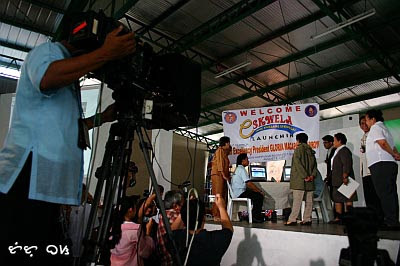 A demo of the Balik eSKWELA project with computers and multimedia was made to President Gloria Macapagal Arroyo under media frenzy typical of presidential sorties. eSkwela Project allows out-of-school youth and dropouts to enroll in the DepEd's Alternative Learning System (ALS) so they can get a high school diploma, the way Manny Pacquiao acquired his high school diploma. It uses non-formal education, computers, freeware (open source? 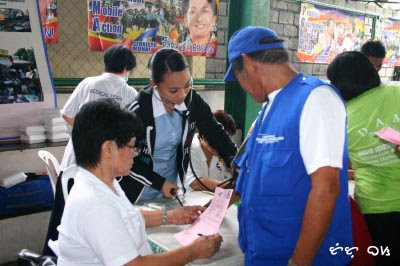 ), multimedia projectors and free Internet connectivity in four pilot sites: Quezon City, San Jose del Monte, Cebu City and Cagayan de Oro City. Songs you usually hear from NBN and other government channels rule the airwaves, posters of the president envelope the whole covered basketball court, and people for various outreach services were present particularly the People's Government Mobile Action (PGMA) offered free medical checkups, job search, free medicines and other things Tutubi didn't check out. There was only a slight drizzle even of typhoon Chedeng was still in Batanes and Dodong's making his presence felt. What's so unusual with the place was that the place lost its dugyot image and put on a false sense of kalinisan. How I wish the president would pass by the place every single day so people would do away with the dugyot ways. I've never tried photojournalism before; I bet it's hard to secure those passes. astig naka kuha ka ng pass at si mrs. president pa nakuhanan mo. pro na pro ang shots! ang galing a! more! dugyut...havent heard that in a while. are you ilocano? Hehehe... I guess we're all guilty of making things extra sparkly for guests... But to go as far as "dugyot"... I agree that she must visit often... or maybe until the idea of cleanliness is ingrained in the officials of the area. This sounds like a very laudable project, when even out-of-school youth could still catch on and have their diplomas. I wish it would be succesful and become so widespread, towards down here in Mindanao. I believe that education is one process that could allow an individualt to capacitate himself or herself. hanep! kakaiba talag pag may connections! Clear ang mga shots mo, galing. Wow! You were close to the chief ! tin-tin, yes, i sure do hope so. 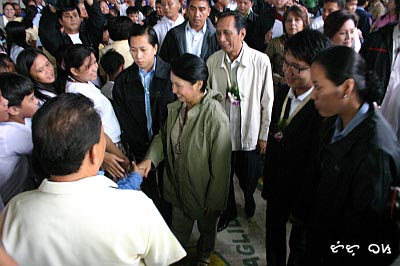 alternati, doing away with dugyot ways requires also the people to mend their ways. so you noticed I shifted the way i write to the third person. I'm more comfortable to write like that, coming form a technical writer taking a plunge in blogging and sometime creative style. germs, indeed. just remember you gotta have the VIP pass plus the PSG-EOD (whatever that means) inspection tag for the camera.